SAN DIEGO, CA--(Marketwired - Oct 7, 2013) - NuVasive, Inc. (NASDAQ: NUVA), a medical device company focused on developing minimally disruptive surgical products and procedures for the spine, announced today that it will exhibit several game-changing new products and procedurally integrated solutions at the 28th Annual North American Spine Society (NASS) Annual Meeting, which will be held October 9-12, 2013, at the Ernest N. Morial Convention Center in New Orleans, La. Newly launched products like the Bendini® Spinal Rod Bending System and the XLIF Decade™ Plate, and new procedures like ALIFACR will be showcased at the NuVasive exhibit booth. The Company's comprehensive cervical portfolio, Precept®, Armada®, MAS® TLIF, MAS PLIF, XLIF®, ALIF, biologics, and the NVM5® neuromonitoring system will also be featured. The Bendini Spinal Rod Bending System is considered the most innovative rod bending system on the market and was released domestically in August as a targeted launch. The XLIF Decade Plate, launched in September, is the latest advancement in providing surgeon customers with an option for a single-approach XLIF and fixation. ALIF ACR will launch domestically after NASS, providing surgeons with a less disruptive treatment for sagittal imbalance. "NuVasive is changing spine surgery, and we are thrilled to demonstrate our unique products and procedurally integrated solutions to spine professionals at NASS 2013," said Pat Miles, President of Global Products and Services. "The new products and procedures that will be featured in our booth this year are designed to improve spine patient outcomes, drive continued surgeon interest, and bolster our relevance as a key innovator in spine. The solutions will be featured in peer-to-peer presentations, providing surgeons hands-on educational experiences and opportunities to become more familiar with our latest technologies." NuVasive Technical Exhibit Booth #2019: The NuVasive exhibit booth will feature a number of innovative products and procedures including: our comprehensive cervical portfolio, Precept®, Armada®, MAS® TLIF, MAS PLIF, XLIF®, ALIF, biologics, the NVM5® neuromonitoring system, and the Bendini® Spinal Rod Bending System. NuVasive Media Booth Tours: NuVasive will grant booth tours for the media during the NASS pre-show on Wednesday, October 9, 2013 from 8:30 a.m. to 9:30 a.m. CDT. If interested, please RSVP to: Nicole Collins, ncollins@nuvasive.com or 858-909-1907. NuVasive Peer-to-Peer Booth Presentations: NuVasive, along with surgeon proctors, will host nine peer-to-peer presentations at the exhibit booth. Please reference the NASS meeting program for additional information. 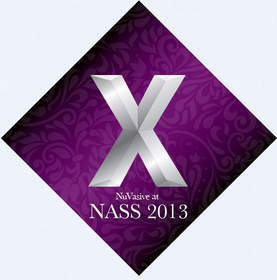 NASS Pre-Courses: NuVasive will participate in two cervical and one lumbar NASS pre-course. Please reference the NASS meeting program for additional information. NASS is a global multidisciplinary medical society that utilizes education, research, and advocacy to foster the highest quality, ethical, value-and evidence-based spine care for patients. The society is comprised of more than 7,500 members worldwide from several disciplines including orthopedic surgery, neurosurgery, physiatry, neurology, radiology, anesthesiology, research, physical therapy and other spine care professionals. NuVasive is an innovative global medical device company that is changing spine surgery with minimally disruptive surgical products and procedurally-integrated solutions for the spine. The Company is the 4th largest player in the $8.2 billion global spine market. NuVasive offers a comprehensive spine portfolio of more than 80 unique products developed to improve spine surgery and patient outcomes. The Company's principal procedural solution is its Maximum Access Surgery, or MAS®, platform for lateral spine fusion. MAS was designed to provide safe, reproducible, and clinically proven outcomes, and is a highly differentiated solution with fully integrated neuromonitoring, customizable exposure, and a broad offering of application-specific implants and fixation devices designed to address a variety of pathologies. Having pioneered the lateral approach to spine fusion, NuVasive continues to be at the forefront of the spine industry's shift toward less invasive solutions. The Company places a large focus on clinical research and support of the Society of Lateral Access Surgery, or SOLAS®, to expand the body of clinical evidence in support of NuVasive's minimally disruptive solutions and to drive adoption of its techniques. The Company's dedication to innovation continues to spawn game-changing technology such as the PCM® motion preserving disc for the cervical spine, XLIF® Corpectomy for tumor and trauma, and Armada®, which treats adult degenerative scoliosis in a less invasive fashion. The Company has also developed procedural solutions that completely redefine and improve upon traditional procedures like TLIF, PLIF, Posterior Fixation, and ALIF. NuVasive's solutions are increasingly being adopted internationally, as the Company lays the groundwork to continue growing as a global business and to offer industry-leading, Absolutely Responsive customer service to surgeons worldwide. NuVasive is focused on becoming a $1 Billion Start-up™; taking market share by maintaining a commitment to Superior Clinical Outcomes, Speed of Innovation®, and Absolute Responsiveness®. NuVasive cautions you that statements included in this press release that are not a description of historical facts are forward-looking statements that involve risks, uncertainties, assumptions and other factors which, if they do not materialize or prove correct, could cause NuVasive's results to differ materially from historical results or those expressed or implied by such forward-looking statements. The potential risks and uncertainties that could cause actual growth and results to differ materially include, but are not limited to those risks and uncertainties more fully described in NuVasive's press releases and periodic filings with the Securities and Exchange Commission. NuVasive's public filings with the Securities and Exchange Commission are available at www.sec.gov. NuVasive assumes no obligation to update any forward-looking statement to reflect events or circumstances arising after the date on which it was made. The 28th Annual North American Spine Society (NASS) Annual Meeting is the premier international conference for spine professionals and serves as a platform to share the latest innovative techniques, procedures, and state-of-the-art training for spine care.